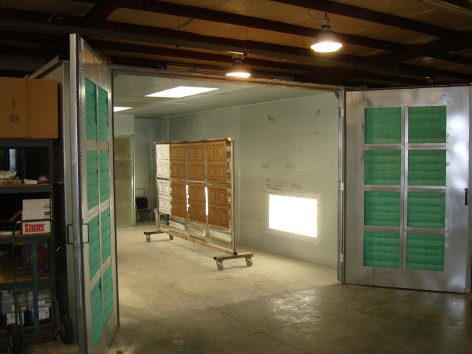 Metal Ceiling Express is an Authentic Tin Ceiling Tile company that has manufactured authentic stamped metal ceiling tiles and various products at our Palmetto, Florida site for over 25 years. 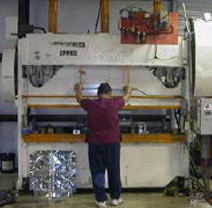 The metal ceiling products we manufacture are proudly made right here in the United States of America using high quality American made meterials. All of our tin ceiling tiles are real metal, not breakable plastic or acoustic meterial. Our tin ceiling tiles (or panels as they are also commonly known) are available in 40 patterns and 100 colors. 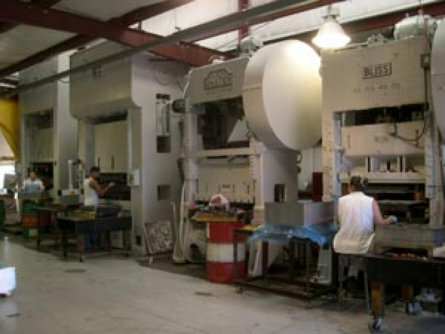 All metal ceiling tiles are stamped using our high-tonnage stamping press and the metal ceiling moldings, tin switch covers, hold down clips and other items are stamped in our smaller stamping presses. 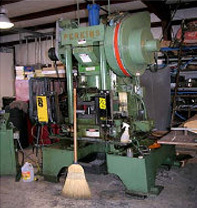 You can view some pictures of our equipment on this page (below). All tiles and accessories are available unfinished, solid colored or hand finished in multiple finishes. Colored items are power coated with a color of your choice and are then baked in our new batch oven to properly and permenantly affix the paint to the tiles. Antique and vintage look items are then hand finished to achieve the final look you wish. 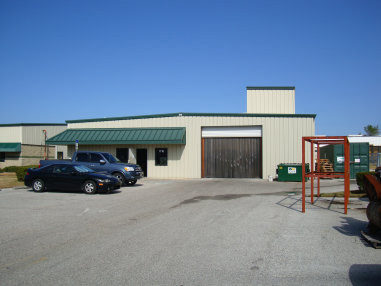 Please feel free to call us at 941-723-2288 with any question you may have. Our customer service staff is standing by to assist you with selecting the right tin ceiling panels to fit your design requirements. We will make sure you order the appropreate quantity of tiles and other products to ensure that your project is completed to your full satisfaction. A representative is available Monday through Thursday from 8am - 6pm EST and 8am - 4pm EST Friday's to assist with questions about dimensions and ordering. 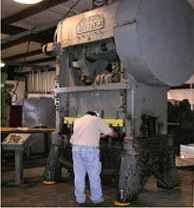 High tonnage stamping presses for superior quality stampings!!! Smaller stamping presses for crown moldings and hold down clips. 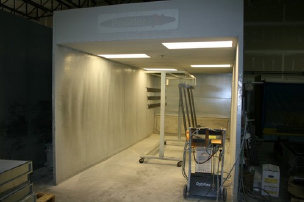 New Powder Spray Booth equipment used to Powdercoat one of our 100 color choices. booth for tiles, moldings & ceiling grid. 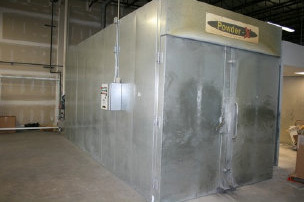 New Powdercoat Oven used to bake the paint directly on to the tin ceiling tiles. New 8' x 8 x 20' Batch Oven. CNC Machining Equipment to machine molds and die sets for stamping ceiling panels, parent company Die-Verse Tool in business 25 years! Don't forget to visit our blog for an extensive selection of articles and material. You can learn about metal ceiling tiles, how to install different types of ceiling panels, usage guides, how tiles are manufactured and much more.